HopStop® is a patented Australian innovation that provides for the humane kill of cane toads. HopStop is an aerosol spray that is sprayed directly onto toads without any need to touch the animals. It anaesthetises toads within seconds, and kills them humanely in 30 ‐ 60 minutes. Toads are physically unmarked by the treatment, and do not display unacceptable physical signs of distress or trauma as a consequence of treatment. In fact HopStop is recommended by the RSPCA for toad control, and by the Queensland Schools Animal Ethics Committee for euthanasing toads for school laboratory studies. HopStop is safe to use around people and pets when used in accordance with the approved product label. Its active constituent, chloroxylenol, is an organic compound. HopStop has also won the Australasian Aerosol Industry Association's 'Innovation Award', and 'Best New Product' award. Once you are sure you are dealing with a cane toad, hold HOPSTOP on a downwards‐directed angle of about 45o and spray the toad for 2‐3 seconds from a distance of 20 ‐ 50 cm. This helps ensure the spray is directed at, and consequently absorbed by the cane toad. One can of HOPSTOP is enough to kill 30 ‐ 40 average sized toads. The toad will hop for a short time, then stop moving and flatten into a ‘hunched’ position. If you think that a lot of the spray missed the toad, apply another short spray. Large toads (more than 10 cm long) should be sprayed a second time. Where possible, let the toad stay where it stops moving. It will lose consciousness and then die there. The dead toad should be collected 1-2 hours later, and placed into garbage. Do not directly handle toads whether they’re dead or alive – wear gloves, or use an implement such as a pair of tongs. HOPSTOP should only be used outdoors. Do not use it inside buildings or other enclosed areas, and do not inhale the spray. Do not spray it towards yourself, other people or animals, and avoid direct application to plant foliage. Do not spray it into or over dams or fishponds. WHAT IS THE MOST HUMANE WAY TO KILL A CANE TOAD? Cane toads are a highly invasive species and are regarded as a major environmental pest in Australia. While there is fairly universal agreement over the need to control cane toads, there is significant debate over what is the most humane method to use. This is largely due to the limited research into the impact of killing methods on toads, exacerbated by the fact that it is difficult to measure pain and distress in amphibians through observation alone. Despite this, thousands of cane toads are killed every year in Australia by government and community groups and individuals, using many different (and sometimes very concerning) methods. The RSPCA believes that any efforts to control cane toads should be carried out as part of a government or community organised program which includes clear guidelines on how toads should be handled and killed. However, there is also a need to provide practical advice to individuals who wish to humanely kill cane toads when they locate them on their property. A recent study into the humaneness of a range of cane toad killing methods has brought into question the acceptability of a number of methods that have been widely used in the past. On the basis of this information, RSPCA Australia has reviewed our previous advice on this topic. 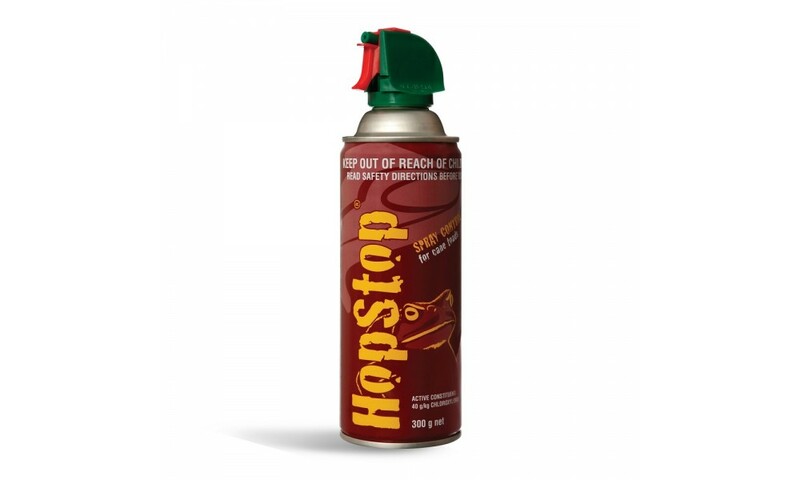 Hopstop® Cane Toad Spray is an aerosol spray that has been specifically developed for killing cane toads and is now commercially available for this purpose. When applied in sufficient quantity it appears to be an effective, easy to use and relatively humane method. It is very important that each toad is treated with sufficient spray to ensure it is anaesthetised and then killed quickly, so two sprays are required with the second applied after the toad has stopped moving. After 2 hours toads should be checks for signs of death before disposal.